The other day I found this book – no I am not getting into where – and just by the look of it I knew this tome was OLD. 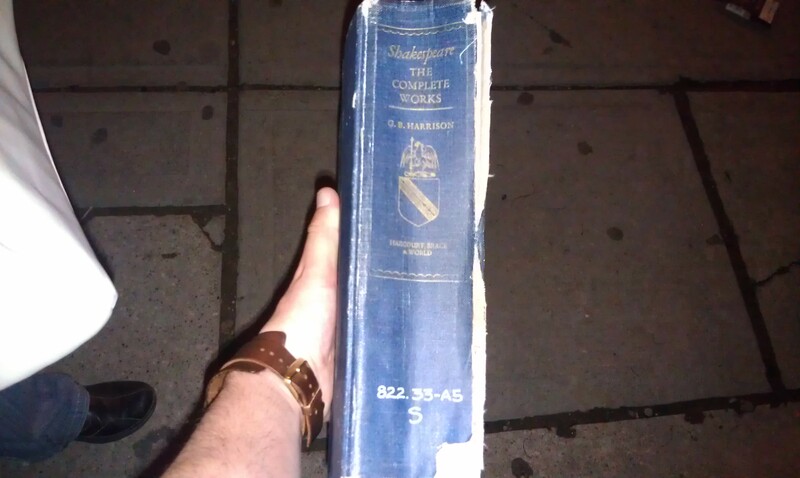 Yes, it does say it is a book of the Complete Works of William Shakesepeare but I wasn’t ready to believe it was THAT old. But how old was it? And where has it been in its life? I opened it up to see if I could find a copyright or published on date and lo and behold I found something much, much better! As you can see in the picture this book had a computer punch card, wow they were quaint back then! When is “back then”? The due date of the book “June 23, 1971” – is exactly 40 years ago today! 40 (years) * 365 (days in a year) = 14,600 (days this book is overdue). Multiply 14,600 by $0.10 for each day and you get…. ….ONE THOUSAND, FOUR HUNDRED AND SIXTY DOLLARS ($1,460) IN OVERDUE CHARGES!!! 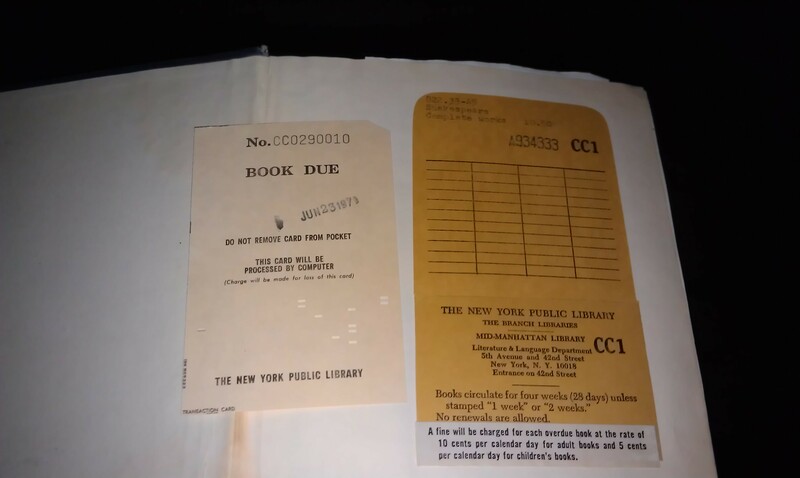 This of course assumes that the fine remained constant which it may not have because I just checked the NYPL website and adult books are charged at $0.25 per day currently. I have to bring this book back and see what they say to me. Will they try and charge me for the late fees? I’d like to see them try and prove that I – a 30 year old – should be responsible for a book that was due 10 years before I was born! 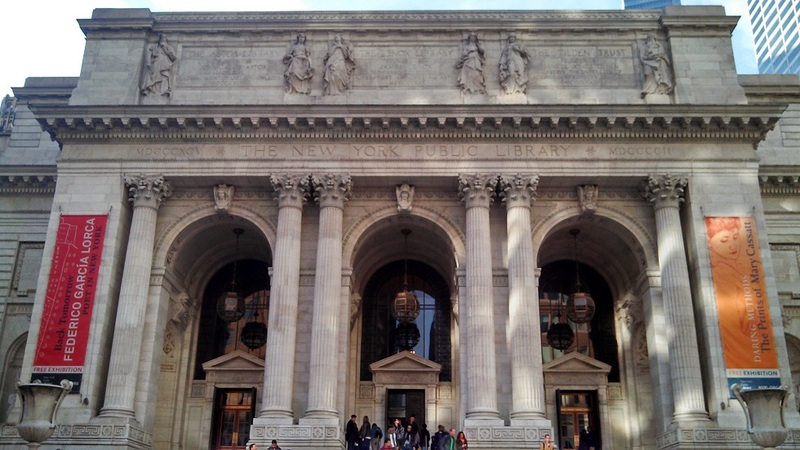 Next time I go to New York City I know I am definitely going to have to stop in by the library. Mid-Manhattan Library: Literature & Language Department at 5th Ave & 42nd St here I come! I wonder if the book is still on file? I wonder if they’ll even take it back!